Beth Grossman, who is running for Philadelphia District Attorney as a Republican. once oversaw the civil asset forfeiture program in the Philly DA’s office. Do you still wonder why some NFL players or other pro athletes kneel or raise their fists during the National Anthem? Here's a hint: It's not because they hate our troops. No, it's because they're aware — often because of their own experiences — of systematic injustice in this country … and they wonder why next to nothing is being done. And it's not just police-involved shootings. Consider the ongoing abuses of the procedure known as civil asset forfeiture. The short version is this: Civil asset forfeitures take a notion that most people support — drug dealers and other convicted crooks shouldn't keep their ill-gotten gains — and, in far too many jurisdictions, have warped it into a kind of bounty hunting program where cash, cars, and even homes can be seized from people who weren't convicted of a crime and sometimes weren't even charged. This can bring in millions of dollars that prosecutors and law-enforcement agencies then spend with little or no public oversight. Last month, a joint investigation by Ryan Briggs of City and State Pennsylvania and Max Marin of Philly Weekly used Freedom of Information requests to document $7 million in secretive and sometimes questionable spending of civil-asset forfeiture money over five years during the reign of now disgraced former Democratic DA Seth Williams, recently convicted of unrelated felony corruption charges. Their probe of how the seized assets were spent or used in Philadelphia ranged from the questionable (construction work by a firm owned by the wife of a detective assigned to the DA's office) to the bizarre ($1,000 in raccoon-removal services, a push lawn mower) to the troubling, including prosecutors who were allowed to drive seized vehicles home, and a seized Harley-Davidson motorcycle that Williams wanted to use himself (with a "DA-2" license plate) to train for the Thrill Show until wiser aides nixed the scheme and auctioned it off. The spending abuses are the flip side of years of justified bad publicity over how the program raises those dollars, often targeting citizens who aren't convicted of a crime and — because these are civil cases, not criminal — aren't even entitled to an attorney. In Philadelphia, independent journalists such as Briggs and Isaiah Thompson have been documenting those abuses for years — the man whom cops wrongly suspected of a drug deal after talking to a co-worker in a parking lot who lost his Buick and $580 in cash, or the man forced to go to court to fight for $6,000 from his rental property business that police seized when he was pulled over on North Broad Street, even though no drugs were found and no charges filed (facing a long legal fight, he agreed to get back only half the money). Thompson's reporting weirdly garnered more national attention than local, forming the basis for a legendary rant by HBO's John Oliver. So with the worst abuses out in the open, there was a massive groundswell of support for reform, right? Yes and no, in Philadelphia — under pressure from a lawsuit inspired by Thompson's reporting — officials agreed in 2015 to stop seizing people's homes without proper notice and this summer (after Williams' ouster) to more sweeping changes on where the money can be spent. But statewide, the most important common-sense reforms — making asset forfeiture not a civil case but a criminal matter, requiring a conviction, and requiring that any seized assets go into the general fund and not to the agencies making the seizures — have been stymied in Harrisburg. The system "is still broken in Pennsylvania," Molly Tack-Hooper, an attorney with the Pennsylvania ACLU, told me. A sweeping measure seemed to have bipartisan support (because there are still some principled conservatives who get bothered by the power of government to take people's stuff) — but faltered when it gained a politically potent opponent — the District Attorney's Association, of course — which eventually led to a greatly watered down version becoming law. Said Tack-Hooper: "The power imbalance is breathtaking" between Pennsylvania prosecutors and regular citizens fighting to keep their homes or cars or cash. Jack Whelan, the Republican district attorney in Delaware County, told me that — unlike the DA's Association — he didn't have a problem with the original legislation, because his office already only goes after assets after a suspect has been convicted. "I have no problem waiting for a conviction," said Whelan, who also said the seized assets pay largely for drug interdiction and education, Even so, Whelan got dinged a little in a recent piece by journalist Briggs questioning the timing of digital billboards on gun-law enforcement that featured the DA flanked by two police officers — right when he was running in a May judicial primary. The Delco prosecutor dismissed the story as partisan politics and noted that the billboards were part of a broader campaign to curb a homicide spree in Chester — but the controversy is also more evidence that the program needs much stricter controls. Back in Philadelphia, despite years of abuses exposed in the media, an association with the taint of civil asset forfeiture doesn't seem to hurt your political career. 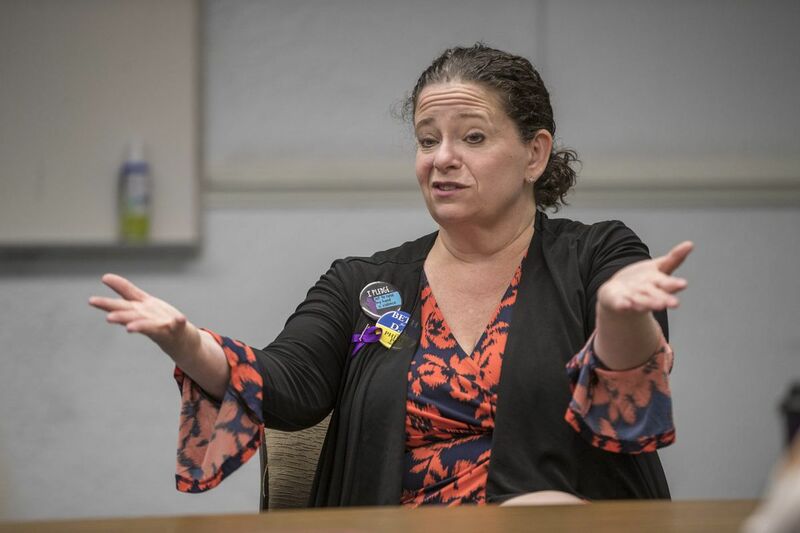 How else to explain how Beth Grossman, who ran the program for years, won the GOP district attorney nomination and endorsements from the Fraternal Order of Police and the Inquirer? Should experience really be considered the No. 1 asset for a new prosecutor when that experience is morally compromised? True, now that she's a candidate, Grossman has pledged to reform the office she once ran. But Grossman is an acolyte of her former boss, Williams' DA predecessor Lynne Abraham, who ran an office with a zeal for the death penalty and mass incarceration and a penchant for wrongful convictions that brought a banana-republic-style injustice to the so-called Cradle of Liberty. Shouldn't bad experience count for something? Grossman's Democratic opponent, Lawrence Krasner, has promised to only pursue assets after a criminal has been convicted. For common-sense proposals such as that, some have branded Krasner a radical. But when you have a criminal justice system that is so badly broken, and so much in need of radical reform, is a radical not what you need? Five months after Krasner's overwhelming win in the Democratic primary, too many people see his victory as a fluke and not what it really was — an uprising of a new majority, boosted by the young and non-whites and others whose voices tend to be marginalized in this town, who aren't just sick of injustice and inequity in America but also are getting fed up with elites who don't take their concerns seriously. Call it a revolution — and call it long overdue.